The Ferrari F50 is one of my favorite cars, either the last or the next-to-last road car with a Formula One engine, depending on how you count it. But there was one detail I never fully appreciated until now: its very strange (and very expensive) rearview mirror. Definitely in view here. Lemme get closer. There we are. That’s the good stuff. 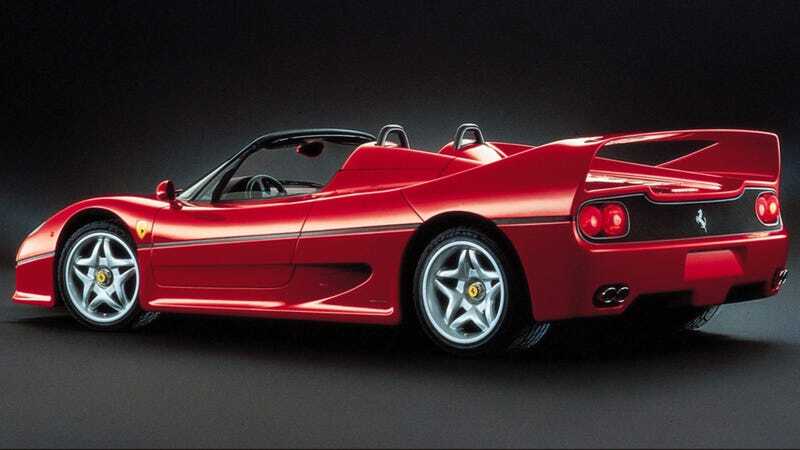 Lots of coverage of the Ferrari F50 will show you the rearview mirror, but rarely will anyone discuss it at length, probably because there are “more important” things to discuss. There is a 60-valve V12 to take in, and a completely see-through mesh rear to gawk at it through. These things, along with the ride and the handling and the cost and the noise tend to dominate impressions. But do not forget about this mirror. Note that it is shaped like a kidney bean. At least kinda. Like, a weird, swoopy kidney bean? Maybe it’s more like a golf course, or an artificial lake on a golf course. In any case, I wanted to find some source that talked about why the rearview mirror is shaped like this, and I went looking for, I think, a Jeremy Clarkson review of the car that chastised its shape, but I think that one has been scrubbed from the internet. And then I realized, hey, there isn’t, there cant really be a good reason for it being this shape. It’s not like there’s something particularly special about how the F50 is shaped. It’s a mid-engine sports car, one with a targa top. The world has enjoyed this shape of car since the 1960s. Do any of those cars have water feature-shaped mirrors? No. Not needed. That’s fine. That’s all fine. No issue there. While looking for some pointless justification for the mirror shape, I remembered my favorite online parts-selling website, Scuderia Car Parts, and decided to look up how much a replacement mirror costs. Ferrari part number 64675810 (figure 23 in the above image) will run you a cool $1,031.49. I double checked a British parts site and got the same figure in pounds. Even a whole side mirror, stalk and all, runs you less at $934.17. It’s just a mirror, too—no fancy electronics here, or anything. Is it worth it? Sure! You could probably 3D print one yourself if you desperately needed one, but I understand that Ferrari only made so many F50s and so many spare parts and such a unique little bit is going to command a premium. That and I like it a lot. If I had a grand to spare on absolutely the most pointless part of a car, I’d consider picking one up and mounting it to my Volkswagen, or maybe put it up in my apartment, just to tie a room together.